Welcome to Anytime Shuttle! We are the best East Bay airport shuttle service to SFO San Francisco Airport and the Oakland Airport. Anytime Shuttle is committed to providing thousands of satisfied customers with excellent service. Our staff of dedicated and experienced drivers are all eager to serve all of your airport shuttle needs. We are the East Bay Area transportation service you can trust. 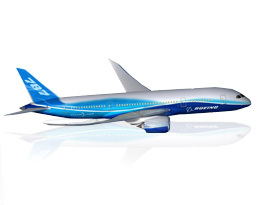 We will get you to and from the San Francisco and Oakland Airport comfortably, safely and on-time. 24 hours in advance and our prices are competitive. Come ride with Anytime Shuttle! Our East Bay Shuttle Service Saves you all the headaches of driving to the airport! Why take an East Bay taxi to SFO or Oakland when you can shuttle to SFO in the comfort of our clean and professional vans? Compare our prices with a taxi service and you will find that our shuttle services are an affordable alternative to taxi services. 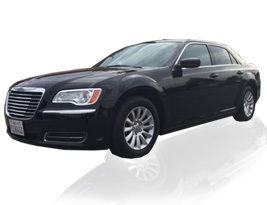 Anytime Shuttle Service is a direct, private and a nonstop airport transportation service. Our SFO shuttle service will pick you up from your designated location and take you to the San Francisco or Oakland Airport. Anytime Shuttle saves time and the best way to travel to and from your East Bay home, directly to the San Francisco and Oakland Airport. Our East Bay shuttle service customers will never have to wait. Driven by our experienced, professional and friendly drivers, we’ll pick you up at your most convenient time, then drop you directly off at your destination. We can also handle special requests, such as providing van transportation for formal galas, parties, weddings, etc. Hourly rates are available upon request. Our friendly staff is available for assistance 24 hours a day, seven days a week! Schedule your East Bay Area Airport Shuttle Service today! Ride to the SFO Airport in Style! Our SFO car service is ready and waiting 24/7. Day or night, weekdays or weekends, Anytime Shuttle is at your service. Why use a taxi cab and pay more? Our pricing is very competitive compared to taxi and other airport shuttle services. Anywhere and anytime, we’re your number one source for airport shuttle service from the East Bay to SFO. Voted the #1 East Bay airport shuttle service! Save time and money with Anytime Shuttle service. We give you the piece of mind knowing that your vehicle is safe at home. 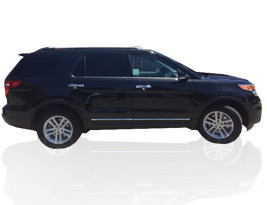 We pick you up from your East Bay home and shuttle you directly to the airport terminal. With a private SFO shuttle service you have the convenience of having a friendly, one-on-one ride to your point of destination. If you’re traveling with family or friends, exclusivity of a private van is the best choice. Enjoy the comfort and ease of not dealing with someone else’s luggage, other than those in your party. Accompanying our healthy growing economy, more and more people are moving to the East Bay Area and with that comes more traffic. 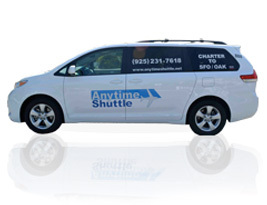 Call Anytime Shuttle, your reliable SFO shuttle service! Relax and we will get you to your final destination without you having to worry about the traffic. Whether its for a corporate event, airport transfers or special events, Anytime Shuttle has the perfect solution for you. Our non-stop service will take you directly to and from the airport, by the hour or from point to point. Enjoy your special event knowing that our professional chauffeurs will take care of the stress of driving and parking. Alameda, Benicia, Berkeley, Blackhawk, Brentwood, Concord, Danville, Diablo, Dublin, Fairfield, Hayward, Lafayette, Martinez, Moraga, Newark, Oakland, Orinda, Pinole, Pleasant Hill, Pleasanton, San Leandro, San Ramon, Union City, Vallejo, Walnut Creek. Don’t see your city listed here? Its OK, give us a call at (925) 231-7618 to see if we service your area. Try our East Bay shuttle service to and from San Francisco today! We also offer a luxurious sedan service to and from the SFO, OAK and SJC. Call today for all your East Bay shuttle service needs (925) 231-7618! I had a very important client of mine that was visiting the Bay Area. I called Anytime Shuttle and had them picked up in one of their luxury sedans. Needless to say, my client was impressed. Thank you Anytime Shuttle! I used their East Bay shuttle service to take me to the San Francisco Airport. The van was clean, the driver was on time and very nice. it was cheaper than a taxi and safer than an Ubur. Not having to drive to the San Francisco airport was such a blessing. I called Anytime Shuttle and they picked up my family and I, and transported us to the Oakland Airport. It was so nice not to have to deal with the stress of driving, parking and paying the parking fees for our 2 week vacation. They also were waiting to pick me up on my return flight. Excellent Service. Anytime Shuttle is very reliable and has great customer service. Our driver last night was very sympathetic to our long flight and did everything he could to make our trip home smooth and comfortable. Very pleased with their service. Flew out of SFO on December 10th, 2014, during the worst rain and flooding in a decade. They arrived early, we made it to our second pickup stop seamlessly and they had the carseat I’d requested for my granddaughter. We made it safely to the airport and ontime. The van was comfortable enough and the driver courteous. He let us choose music we thought my granddaughter would like. Upon our return the following week, we called and met them within minutes of claiming our bags. I love that they are a private shuttle and I feel the price is reasonable and saves me the hassle of driving and parking. I am getting ready to book them for our next trip! Excellent service to & from the SFO airport!! My driver arrived 25 minutes(5:00am pick up) early & loaded all of my family’s luggage(8 bags total) with ease into the cleanest(Toyota Siena) van that I’ve ever been in!! No traffic-so getting to the airport was a breeze!! We got dropped off…and we were on our way!! Coming back….no problem!! Our flight was 30 minutes late & when I called to let them know-the really nice dispatcher stated that that was no problem & to call I’ve we got our luggage-which I did…and with in 10 minute we were all loaded into another spotless van and heading home!!! What a great ending to a fantastic vacation!! I will be using Anytime again and will sing their praises to all of my traveling friends!! They really impressed me with their easy booking process & great service!! Absolutely loved working with Anytime Shuttle! The driver arrived a few minutes early to pick us up and was waiting for us upon arrival when we returned home. The best part? Our driver wasn’t a reckless one! I’ve had experience with other airport shuttle services and their drivers were just reckless! Talking on the phone, driving like a madman, cursing! What an unpleasant way to start a vacation or any trip for that matter. Our driver was polite, courteous, and an amazing driver. I never once felt like I was in danger for my life! lol. We will definitely continue to use Anytime Shuttle in the future when needed. They are the best East Bay shuttle service around! I have used AnyTime on 2 separate occasions and am extremely impressed to say the least. Both trips have been during long heavy traffic commute times. Ride is comfortable, clean and relaxing. Staff is friendly, always has offered water, opens doors and loads luggage. But even more importantly that have been on time or early on all scheduled trips. Prices are also extremely reasonably, especially considering my commutes are from Pittsburg. Since cost is so reasonably I prefer using them instead of parking car at airport and worrying about car security while away. The online booking system is easy and quick to use also. So making reservations takes minutes. They are a 5 star service all the way. I will not just be using AnyTime for business anymore, but even for personal travel trips also. In my opinion, they are the best of the 3 East Bay Shuttle Services I’ve tried! Learn more about our Bay Area car service here. Dont see your city listed here? Its OK, give us a call at (925) 231-7618 for more info on our shuttle to SFO.